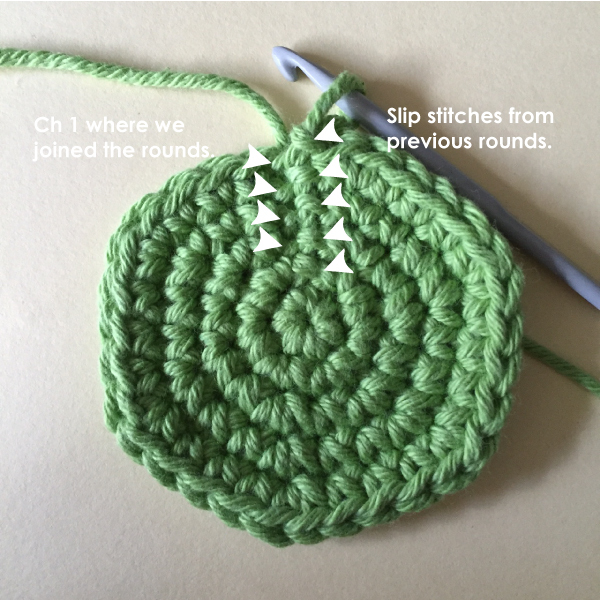 There are 2 ways that I know of crocheting in the rounds – the continuous rounds (no joining required) and the joined rounds (joining required). 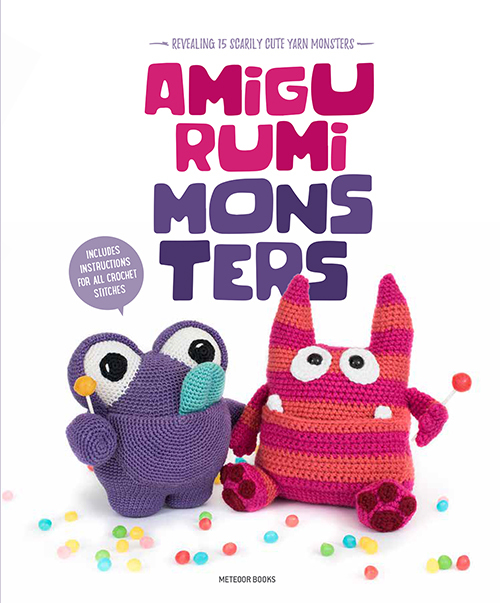 The continuous round requires no chaining at the start or slip stitching to join and complete rounds. 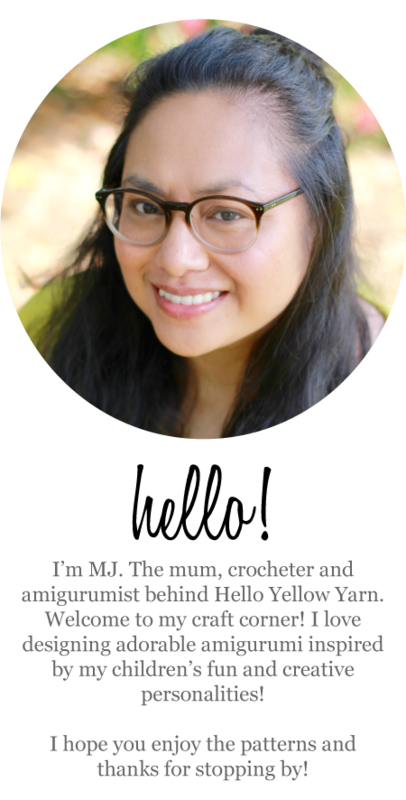 It’s just that, continuously crocheting in a spiral. Some patterns will need you to join rounds. If you are not sure how to do it, the following steps show how I join rounds. 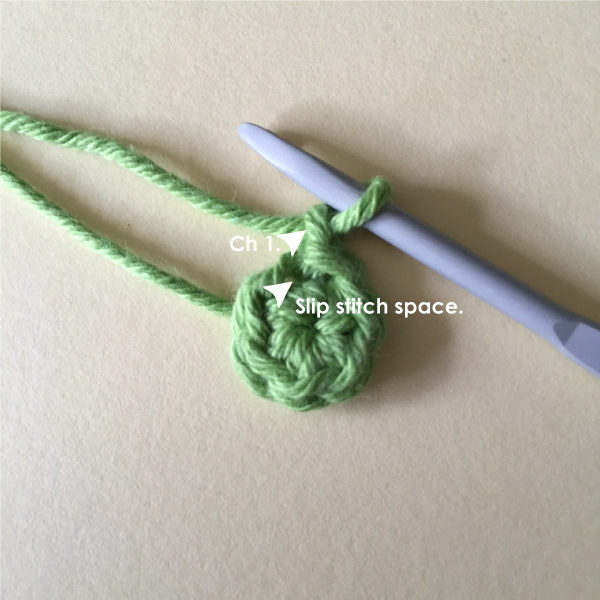 I join my rounds by making Ch 1 at the start (which is never counted as a stitch) and I end my rounds by joining to the Ch 1. Not all joined rounds are done this way, however, I hope this will at least be a helpful start. Let’s start with 6 single crochet in a magic ring. This will be Round 1.
to the first sc of the round to end Round 1. 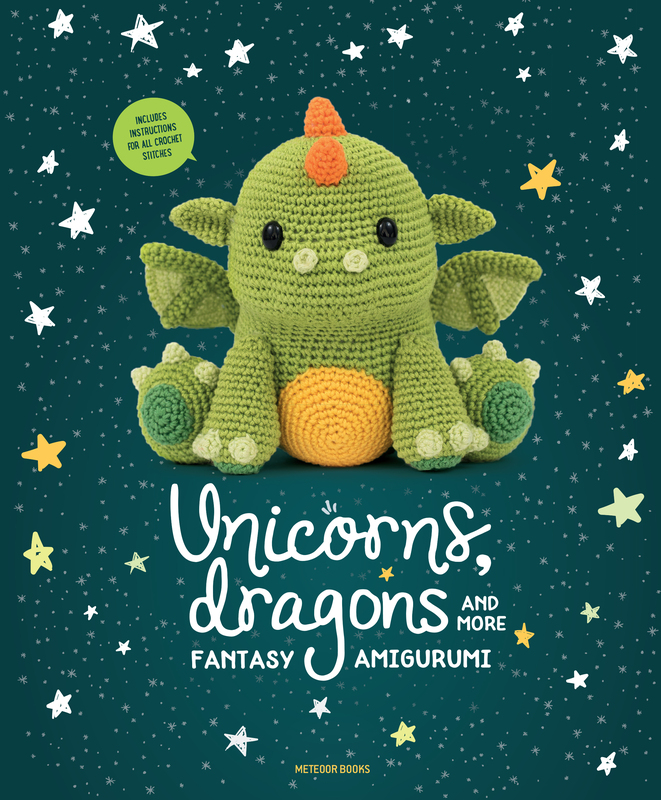 To begin Round 2, you will need to Ch 1. *IMPORTANT* – this next step will only apply to Round 2. 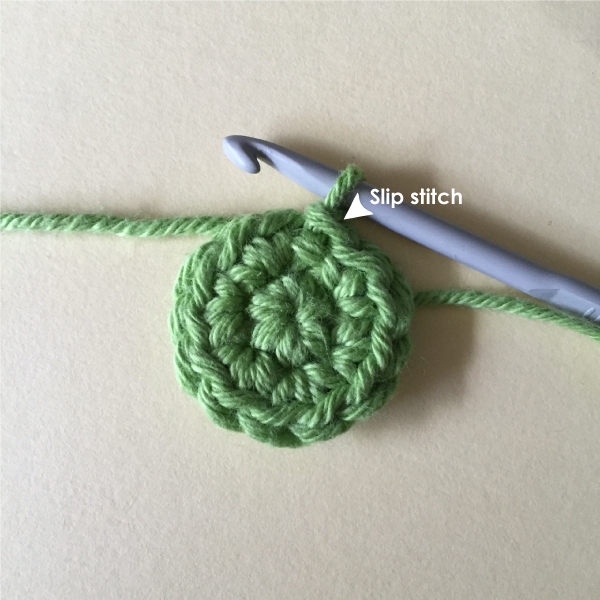 You are increasing the round by 6 so you need to make an increase in each stitch. 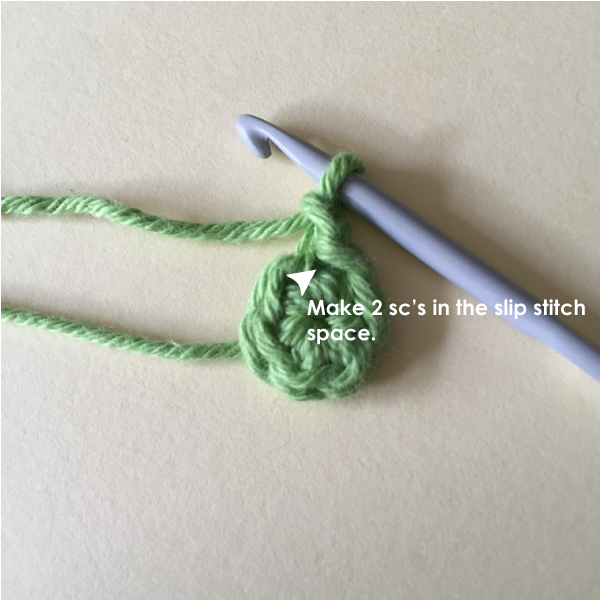 You will need to make your first increase (2 sc in one stitch) in the same space as the slip stitch from the previous round. Now that you’ve made your increase, you will need to continue increasing the next 5 stitches. As you can see in the photo, there are 5 remaining stitches from the previous round. 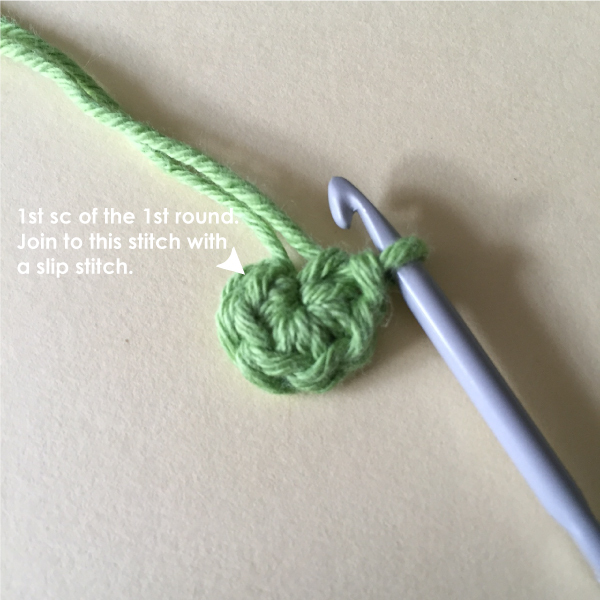 You’ve already made the first 2 sc’s so work your increases in those 5 stitches to give you a stitch count of 12 by the end of that round. 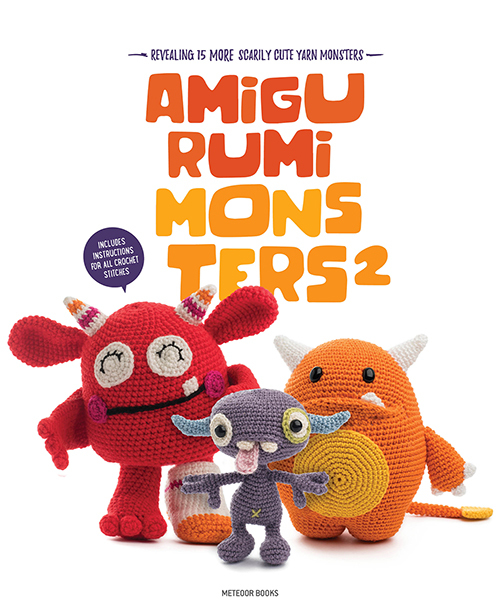 Now to complete Round 2, you will join the round with a slip stitch to the Ch 1 you made at the beginning of Round 2. 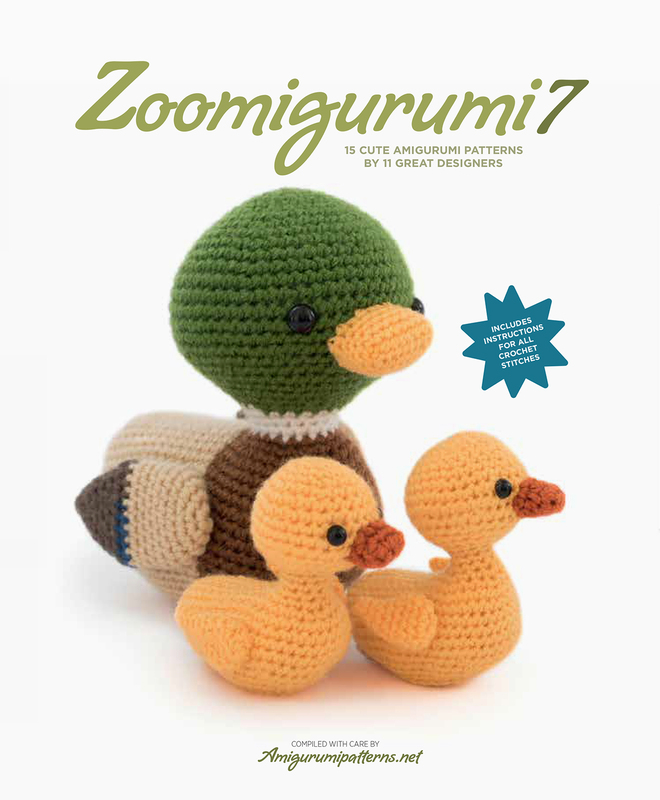 You will see a slip stitch from the previous round. Skip that completely and join directly to Ch 1. 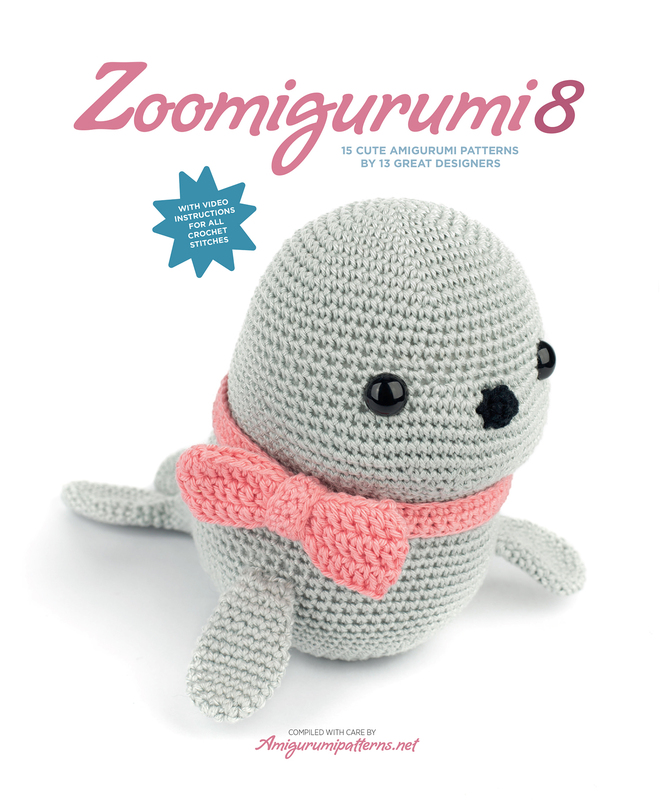 Round 2 should be complete and look like this once you’ve made your slip stitch. To start Round 3, Ch 1 again. 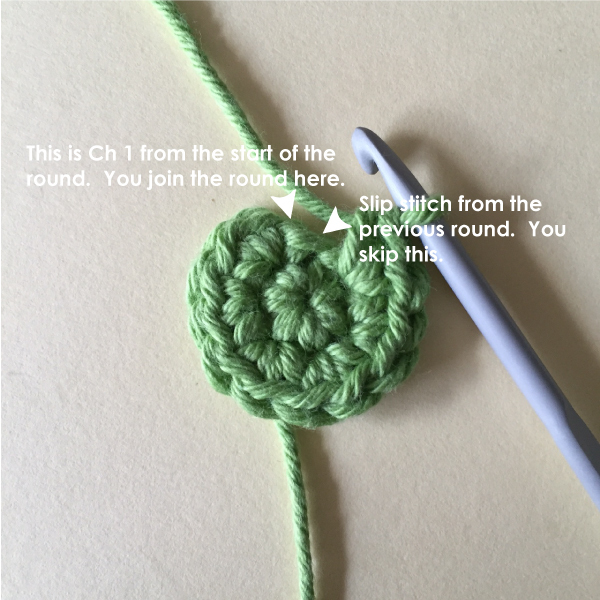 You are increasing the round by 6 – this time (from Round 3 onwards), you will make your first crochet stitch in the first sc of the round. Sc 1, inc; repeat 6 times. You should have a stitch count of 18 at the end of Round 3. 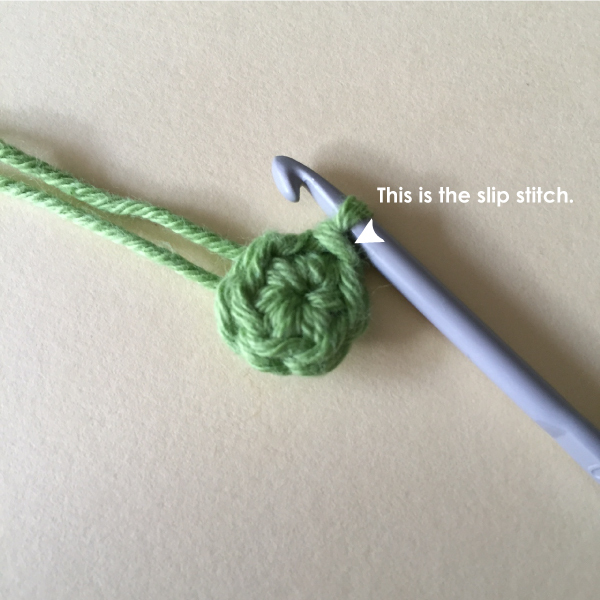 Remember to end the round, you must always join with a slip stitch to the Ch 1 you make at the beginning of the round and skip the slip stitch from the previous round. This is what 5 joined rounds look like. You can see the joined stitches to Ch 1 and the slip stitches from previous rounds. 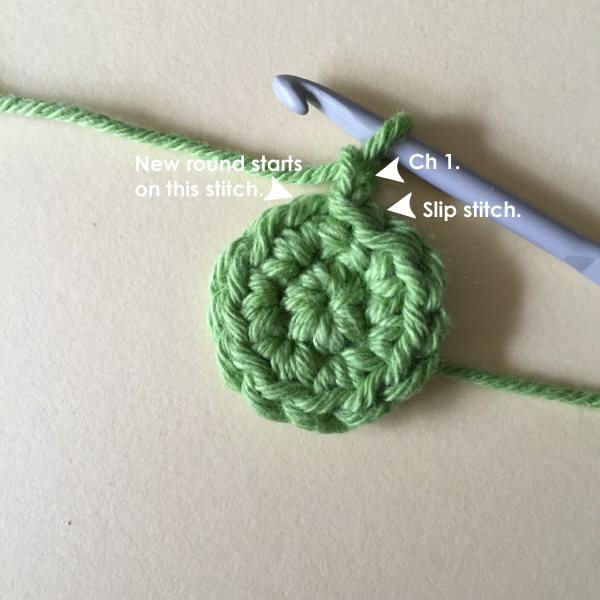 So in summary: always Ch 1 to start a new round (from Round 2 onwards) and end the round with a slip stitch to the Ch 1. 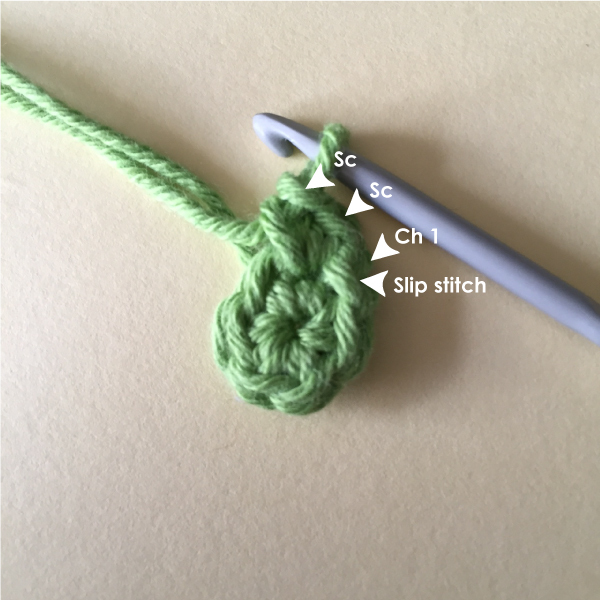 The Ch 1 is never counted as a stitch. Joined rounds have its pros and cons – you have cleaner and even rounds but you also see the seams. 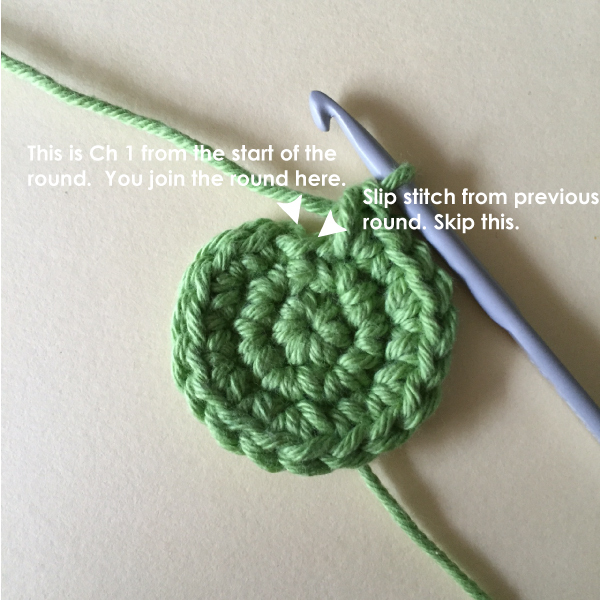 Whereas you don’t see the seams if you are crocheting in continuous rounds, you do however get a jog in the rounds.